Alienation in Nathaniel Hawthorne's Fiction: Introduction The "alienation of the artist" (or intellectual) has a metanarrative (an all-inclusive story or an archetypal mythology) as Joseph Campbell's Hero with a Thousand Faces suggests. In fact, according to Campbell, the artist is the creative citizen who journeys inward and returns with something vital to relate to the culture. He ends his book suggesting that in this democratic age an artist is someone who "heeds the call" to art's higher purpose. The artist doesn't wait for others, who may be distracted by material gain or by "sanctified misunderstanding." Campbell suggests that the artists in a democracy live as though the day were here, suggesting that artists do not wait for society to save them but must be redeemer-like in humble leadership in an effort to save society. The artist's point of view is one of existential alienation. When a society alienates its artists, the artist suffers a social alienation, a second alienation where a society applies the label of "other." Social alienation is a rejection added to the existential withdrawal of the artist. In Hawthorne's world, the alienation experienced by the artist would be almost identical to that experienced by the intellectual. In the case of the artist as well as the intellectual, the individual sets himself or herself apart from others and, as a consequence, is, in turn, isolated by the larger society. The popular belief in ideas such as "Secular Calling" and later the "Protestant Ethic" contributed to the social alienation that Hawthorne experienced. The American Puritan belief in Secular Calling, and the Protestant Ethic, led to the later idea that if in the marketplace one is successful at one's calling, it is a sign that God favors one on Earth. Since both artists and intellectuals tend to reject the values of the marketplace, they place themselves in a position separate from those values that drive mainstream culture. This would have been as true in Hawthorne's day as in our own. Claudia Durst Johnson elaborates on Secular Calling and Protestant Ethic and the effect they had on Hawthorne and his fiction in her lecture "Work and Money in Hawthorne's Fiction." Secular Calling and Protestant Ethic, reinforced by the literal interpretation of the Bible, emerged from the value system of the Puritans and their progeny who thought of artists and intellectuals as potential tools of the devil, alienating both from the social order. For Nathaniel Hawthorne, a scholar and a writer of fiction, this value system inherited from his Calvinist forbears, complicated the existential alienation in his creative cycle with social alienation. For Hawthorne, America, the New Eden, is replete with uneducated citizens antagonistic to the arts and culture. In Richard H. Millington's essay "The Meaning of Hawthorne's Women," he muses "not about Hawthorne's identification with women but his literary presentation of himself AS one." 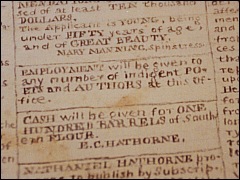 The social alienation that Hawthorne experienced was similar to that which women faced. We can learn much about the alienation of the artist and intellectual in Hawthorne's day by studying alienation and women in Hawthorne's fiction. In his fiction, Hawthorne presents numerous artists and intellectuals. Some, like the sculptor Kenyon and the painters Miriam and Hilda in The Marble Faun enact their roles through the practice of the visual arts. Their conversations reveal Hawthorne's ideas about the nature of sculpture and painting and how these two art forms and the artists who practice them differ. Others, like Holgrave of The House of the Seven Gables, work in the new medium, photography, allowing Hawthorne to introduce questions about the way technology influences art as well as how the artist may feel distanced from his culture and its values. Many of the artists and intellectuals in the short stories are easily identified, while others, including Ethan Brand, are more difficult to see as such. All, however, are seekers for a deeper truth, for whom alienation has become a defining element. In stories such as "Drowne's Wooden Image," Hawthorne explores the tensions between folk art and high art, suggesting that different standards define not only the arts themselves but also the relationship of the artists to each other and to their surrounding culture.